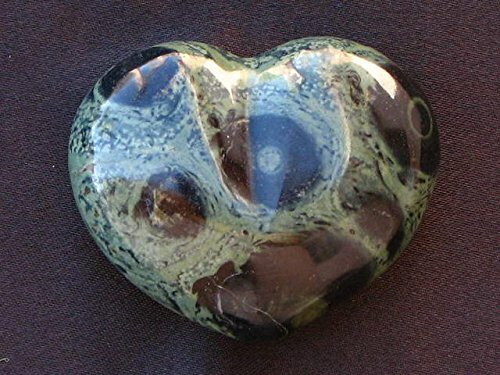 Crocodile Jasper Decorative Heart. This Crocodile Jasper Hearts was mined from the Norcross-Madagascar Crocodile Jasper quarry. You will receive one piece, similar to what is photographed, with this order. Color: Multi-colored, Solid. Yellow, Orange, Brown, Green. Metaphysical guide: Crocodile Jasper (also known as Kambamba Jasper) is an exotic looking jasper from Africa. It is said to mystically soothe the nerves and state of mind. As with other jaspers, traditional lore says that it is good for grounding and protection. It is purported to be beneficial for plant growth and health, particularly in arid environmentsor where the soil is poor. VERY IMPORTANT: This is a natural material which means you are receiving it exactly how it came out of the ground. Many of our pictures were taken with the stones being wet which helps to show the materials true colors and clarity. It may not have the same appearance when dry unless it has been polished, tumbled, or cabbed. If you have any questions regarding this item please contact Gem Decor prior to purchase so we can ensure you will be completely satisfied with your purchase. Great for gifts and metaphysical wellness. If you have any questions about this product by Madagascar Minerals, contact us by completing and submitting the form below. If you are looking for a specif part number, please include it with your message.